A Meteorite is a naturally occurring object originating in outer space that survives an impact with the Earth’s surface. These artifacts from outer space provide us with a snapshot of both the origins of Earth and our solar system. As the solar system formed more than four billion years ago, primitive particles collided and clumped into increasingly larger bodies. Many asteroids retain their ancient components virtually unchanged, however, planets, moons and some larger asteroids partially or completely melted. Dense molten iron (carrying other dissolved elements) sank to the cores of these bodies. Molten rock and silicate crystals hardened into rocky mantles above the cores. 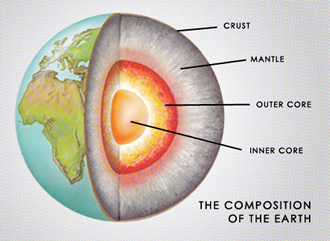 Further partial melting of the mantles caused crust to form, as on Earth. Some meteorites come from differentiated planets and asteroids, which started as chondrites but melted and separated into iron and stony parts. Iron Meteorites, for example, come from the cores of asteroids that broke up in collisions. And Stony Meteorites form once-molten crusts and reveal surprising details about how their parent planets formed. The rarest of meteorites is the Urban Meteorite which is believed to have formed from the outer most surface of the crust. These silica rich, rock-like objects are found concentrated in certain parts of the world. Like all meteorites they are given names based on the location that they were discovered. Because of their rarity and their unique individual qualities, levels of classification are given based on city street names, for example, an Urban Meteorite from Berry Street is called a Berryte and one from Driggs is called a Driggsite. 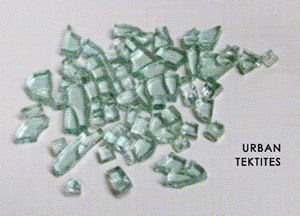 An Urban Meteorite find is always accompanied by the presence of Urban Tektites, silica crystals which are green-blue in color. There is much speculation about the formation of Urban Tektites, more commonly referred to as "Street Diamonds," however, scientists believe that they were created by energy generated from collisions and impacts on the Earth’s surface. It is thought that the heat generated from these impacts is sufficiently great to fuse all materials present. Urban Meteorites consist of less than 1% of all meteorites found yearly, making them incredibly rare. You will be very lucky if you find one.